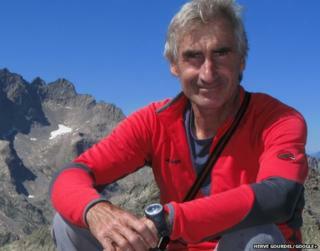 He said France would do everything it could to liberate Mr Gourdel, but that the situation was "extremely critical." Islamic State militants warned on Sunday they would target Americans and other Western citizens, "especially the spiteful and filthy French", after French jets joined the US in carrying out strikes in Iraq on IS targets. Media captionLaurent Fabius: "The situation is extremely critical"
France on Monday raised the threat level for 30 of its embassies throughout the Middle East and Africa in response to what Interior Minister Bernard Cazeneuve called "yet another demonstration of the barbarism of these terrorists". French Prime Minister Manuel Valls said there would be "no discussion, no negotiation" with the kidnappers. "If you give in, if you go back one inch... you give [terrorism] this victory," he told French radio while on a visit to Germany on Tuesday. France's foreign ministry said in a statement: "We confirm the authenticity of the video showing images of French hostage Herve Gourdel, kidnapped in Algeria in the region of Tizi Ozou on Sunday." "The threats made by this terrorist group show once again the extreme cruelty of [Islamic State] and those who say they are affiliated to it." Speaking in New York, where he is attending the UN General Assembly, Mr Fabius told reporters: "We will do everything we can to liberate hostages... but a terrorist group cannot change France's position." Apparently speaking under duress, he said: "This armed group is asking me to ask you [French President Francois Hollande] to not intervene in Iraq." President Francois Hollande's office said he had spoken to Algerian Prime Minister Abdelmalek Sellal by phone and that there was "total co-operation" to try to find Mr Gourdel. "Authorities are mobilised and no hypothesis is being discarded," the French government added.